Get the Start-to-Finish Video Course for 75% OFF! Have you ever wanted to write a children’s book? I will bring you through the entire process from start to finish. I won’t leave a single stone un-turned and I will PERSONALLY be here to help you through the entire process. This is one of the best times in history to be a children’s author. The barriers to entry are dropping rapidly, and the market is far from saturated. I’ll show you how to define your book’s value, create your own market gap, identify with your readers (and buyers) and create a product that delivers huge value and enjoyment. We begin with the end in mind to create a product that will have a definite purpose and unique selling point(s). 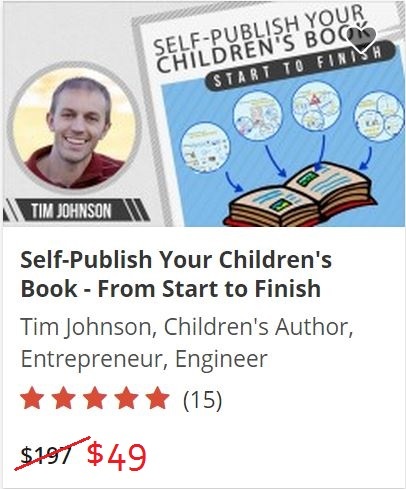 This way you, the author, can be confident before you even begin your self-publishing endeavor and you will have a definitive plan and specific target audience interested in your book. Contrary to popular belief, you can self publish your book even on a very limited budget, and I’ll show you how. Sign up now to get this $197 course for 75% OFF!